This one’s actually pretty sad. I feel bad for Locke. Used a different font on this one. I think I like it better, but I don’t know. Maybe it’s too fancy. Finding the perfect font is a little harder than you might think. If you want to see how this one was made, I put up a few pictures in the forums. I put a lot of sketches and stuff there too. I also put a little something on my DeviantArt. That outside shot of the store came out AWESOME. What does everyone else think? I think it’s AWESOME. This entry was posted on Friday, December 12th, 2008 at 12:00 am and is filed under Comics. You can follow any responses to this entry through the RSS 2.0 feed. Both comments and pings are currently closed. meh…at least we are getting the story ones done before this comic takes off. Yeah, I want the characters to be more than just “two guys on a couch playing games”. Video games will always be the main focus though. Plus it’s hard to constantly come up with video game jokes haha. I would understand why it is harder too, you have to draw entirely new characters. Awww… Thats sad. Where is the store. I’d go, can’t be sure that i’d buy something but I would check it out for sure. Oh, no, there’s no actual store in real life haha. There’s a virtual one, (you can buy a shirt) but no real one. That’d be pretty awesome though. Locke and I have actually talked about opening a real store though… There’s no gaming stores where we live. Maybe you could rent/buy a place in a small shoping center, like a place near where i live called The Shopping Center (lol) It’s awesome, it’s full of gaming stores and internets cafes. There are also a couple of restaurants on the first floor. If u guys ever come to peru you should drop by and take a look. Web comics shouldn’t have plots that demand expositional chapters. You can’t afford it. You have very limited space with the point being: “Tell a joke.” No joke, no comic. Unless of course you are going for a deep plotline that requires such set-up, but I don’t get that indication that there will be drastic plot twists or character reveals or whatnot somewhere down the road. 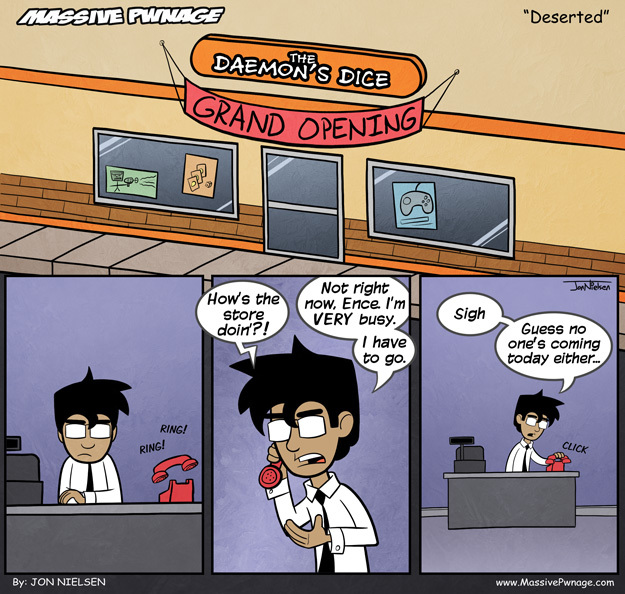 Just more “Hey Locke works in a game store” strips. You need to get to the point before you’re too bogged down by being forced to “Follow a linear plot” that you’re unable to do what you really want because “Something hasn’t happened yet.” Look over Super Effective and you’ll get exactly why you shouldn’t set up a web comic in that format. I think the sign should have had the D20 symbol in the background, because that looked awesome on the website that Locke was on. Ooga Booga is on the storefront window and no one is walking in?